For the last month or so I have been working on a little project at AOL as part of the AIM group called the BuddyUpdates. BuddyUpdates, offers a way for AIM users to share their actions with the rest of their buddy list. This product has been available since 2005 within the AIM client. Note this was well before the Facebook news feed was unveiled and Twitter or number of other lifestreaming services existed. The web-based BuddyUpdates interface launched publicly on July 9th and we have been sharing it with a small group as we continue to update it. So if you use AIM you can pull in all you favorite services like Twitter, Flickr, YouTube, Viddler, Digg, Mixx, StumbleUpon and so on and share them with the rest of the folks that have you on your buddy list. If you are on the AIM client you will see a little orange icon next to a buddy screen name that has BuddyUpdates. Upon clicking the orange icon you can view their updates. 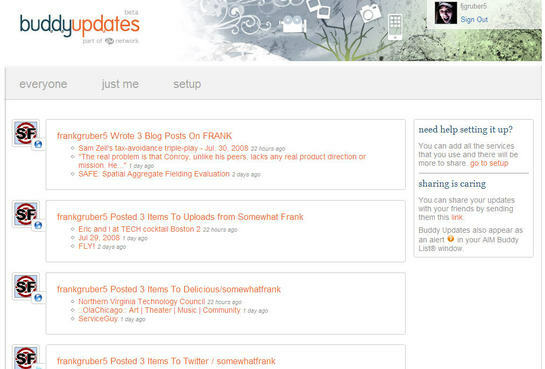 BuddyUpdates offers a Web interface for setting up and viewing these updates. BuddyUpdates offers a simple way to see all your AIM buddies lifestream updates on the Web. Check out my AIM BuddyUpdates here and setup yours here. Please keep in mind, BuddyUpdates is just an early beta and was pulled together with very small team at AOL in less than thirty days. We hope you find it useful. I twittered out about BuddyUpdates yesterday to give some followers a preview of the product and there were some great reviews on Lifestream Blog, Rotor Blog and Profy.com.